I am on vacation in Athens, Greece. Every food bill I received, and gifts from shops had a 25% tax rate which, the people explained to me ‘nicely’, goes to the government. It seems that people are very odds with the huge unemployment, high taxes, and forcing illegal immigrants out of the country. I got all of this from the nice people. There were others who seemed bitter and standoffish, visible disdain of anyone not from Greece, from the Turks, Pakistanis, all the way to the Jews. Extremely xenophobic, and this is the birthplace and cradle of logic, and helped with the maturation of the Western civilization?! From their perspective, I surmise, the local Greeks have to yield to the ‘foreigners’ because they do, in fact, gather a large sum from tourism, and the other aspect, or perspective, they must also loathe having to yield jobs, even their own profession, to foreigners. I spoke to a Greek man, taxi driver, by trade, was a bartender and had a degree in hotel, restaurant, and management. In the states, he worked as a bartender, but his home was Greece, his parents Greek, but he said it was a tough market to get a job for hotels. Now this man had been out of Greece for a while, worked in the U.S., and had a US foreigner accent. Bartending to a Cab Driver was a natural transition, and truth be told, he could probably go to the United States and make more money verse the cost of living than he had in Greece, and as well, perform his occupation of choice. I asked him why he stayed, and he said Greece was his home, and he loved it there. So, while perusing through all of the ruins, looking at the sites, watching the tour groups, and the tour guides explaining these empty ruins, I pondered, wouldn’t it be amazing to see the people of ancient times dressed in their clothing of the times, interacting with each other through the ruins as though the tourists were not even there. In effect, acting out scenes that perhaps took place thousands of years ago, echoes of the past. I thought why wouldn’t for starters, the government pay the people of the Arts and Sciences to go through scenes, such as basic interactions with a Librarian, studying in one corner, ignoring the world, and just reading and thinking, and in another corner of this library, there might be a quiet debate going on, in Greek of course, and through a translation application, any foreigner could hear their native language the interactions. It could be ancient commoners, to known ancient people of the past acting out scenes like echoes of the past, while tours just come up close and personal, pass by, even wave their hand in front of an actors hand, and he continues to act as if the tourists were not even there. These narratives/scenes could be recorded, and played out through Augmented Reality glasses, and/or live actors. As this plan develops, I thought it would inspire not only the locals in their own rich culture, but, tourists to bathe in this once, pinnacle of civilization. I went to Greece in the “off-season”, but the streets were still not empty. The shops and restaurants had guests, but as one local restaurant family business owner said, and I am paraphrasing, it’s a tough job in the off season trying to attract people into his restaurant, which had excellent food, by the way. The plan develops further in my mind as I sit in the runes of an ancient Greek library, it would be inspiring for the people of the nation to see guest appearances of their local representatives of government to see the government officials also taking part in these acting events. The founding fathers of the United States of America weren’t career politicians, they were agriculture, farmers, the fifth president of the United States, James Monroe, his father Spence Monroe was a moderately prosperous planter who also practiced carpentry. People of Greece suspect their governments of terrible things, such as corruption, especially when they aren’t visible to the people constantly. Appearing along side the people of their country as commoners of a great society with a world of fascination and myths surrounding it, is like fodder for actors and play writes. 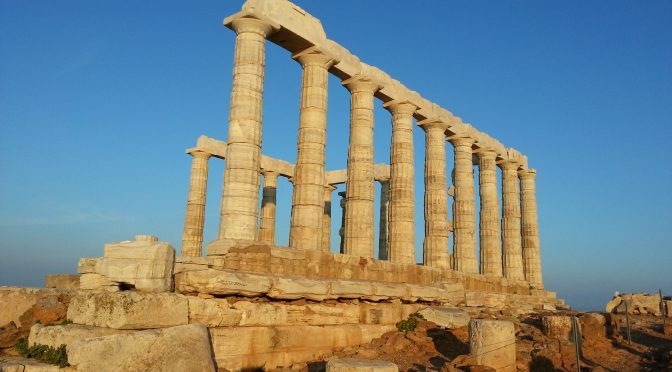 Greek people in universities, the Arts and Sciences, may debate some elementary topics in the sciences in public forum, and if the professors and students of universities dressed in ancient traditional Greek garb, I think it would be amazing to add them into the ‘scene’ so to speak. Tourism in Greece has been a key element of the economic activity in the country and is one of the country’s most important sectors. Greece has been a major tourist destination and attraction in Europe since antiquity, for its rich culture and history. Greece attracted 26.5 million visitors in 2015 and 30 million visitors in 2016, making Greece one of the most visited countries in Europe and the world, and contributing 18% to the nation’s Gross Domestic Product. These live productions can go on year-round in cooperation with global exchange student university programs, of the finest caliber. This forum may attract global play writes of note, not just of University, but of the major, well-respected avenues of theater, such as Broadway, and the motion picture actors turning to the theater might want to give ‘this avenue’ a try first, as a sampling. Revenues from the University exchange programs, revenues from play writes actually paying royalties to use the archaeological sites, as well as more jobs, for cultural supervisors to oversee these programs, as well, as jobs for my taxi driver, because the once birth of logic will again become the maturation place of Education, the Arts, and Culture, as well as all the other good stuff that comes with it, such as revenue and jobs to help support this boom people going to Greece. Oh, sorry, my taxi driver might want to go back to bartending and serve drinks to those university professors, students, and still, have to deal with those pesky tourists. 🙂 To those students around the world, don’t be surprised if your waitlisted here too!